Last Christmas Eve I attended along with several of my family one of the services at Crystal Cathedral and was shocked at the changes taking place there. The congregation had declined significantly and the choir was a quarter of the size it use to be plus none of the top name professional musicians were there like they usually are. Our family has been going to Christmas Eve services at the cathedral for more than 20 years and it always is a wonderful holiday experience but not so much this last year. 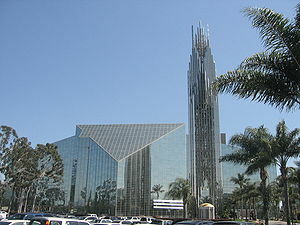 Since then, the Crystal Cathedral has gone into bankruptcy and the buildings and property are being sold. Meanwhile the graying and depleted congregation that was a mega church for an entire generation in Southern California is left to leasing their own former buildings. However in the midst of all of the trouble and depressing decline there is an unlikely move of God going on in the Hispanic Ministry at the church. The Spanish speaking services continue to grow at an exponential rate. Since former Argentine Assemblies of God pastor Dante Gebel was put in charge of the Crystal Cathedral’s Hispanic ministry 2 years ago it has grown from 300 to 3,000 people, and is actually now larger than its parent English speaking congregation. Plus the services are far more Charismatic and Pentecostal and nothing like the traditional English services there.